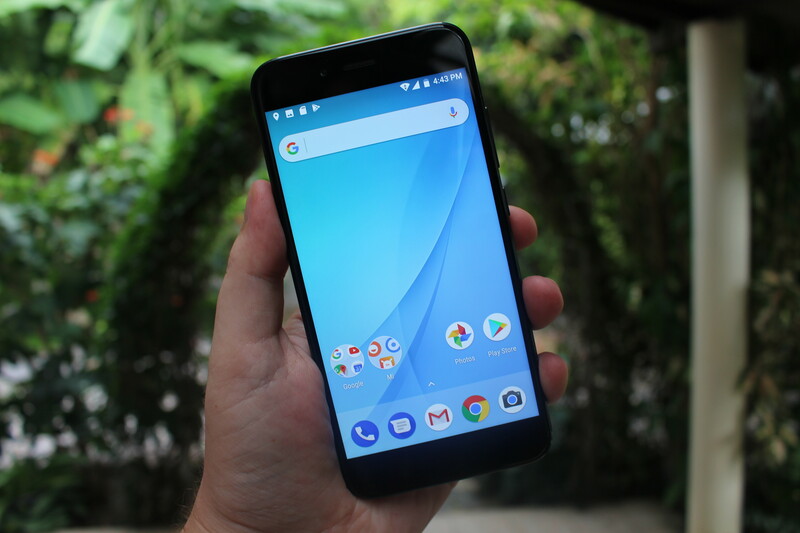 Xiaomi Mi A1 hardware specifications are pretty much standard for a mid-range smartphone, except possibly for its dual rear camera, and what makes it stand apart is really Android One program that promises regular firmware update, including to the latest “pure” Android version, during a 2-year period from launch. In my case, the phone is also interesting because so far I had only used smartphones with Mediatek SoCs, and Mi A1 is equipped with a Qualcomm Snapdragon 625 processor. SD625 should be slower than the Mediatek Helio X20 deca-core processor I’ve been using in Vernee Apollo Lite, but I’m curious to find out if some apps have been better optimized for Qualcomm processors. I’ll soon find out as GearBest sent me a review sample.I’ll start with an unboxing and first boot post, before writing the second part of the review in a couple of weeks once I’ve finished testing the phone. I took a while to go through customs because local authorities did not know that model/brand, and at one point I understood there was no hope and I had to abandon the smartphone, since I could not provide the required paper work. 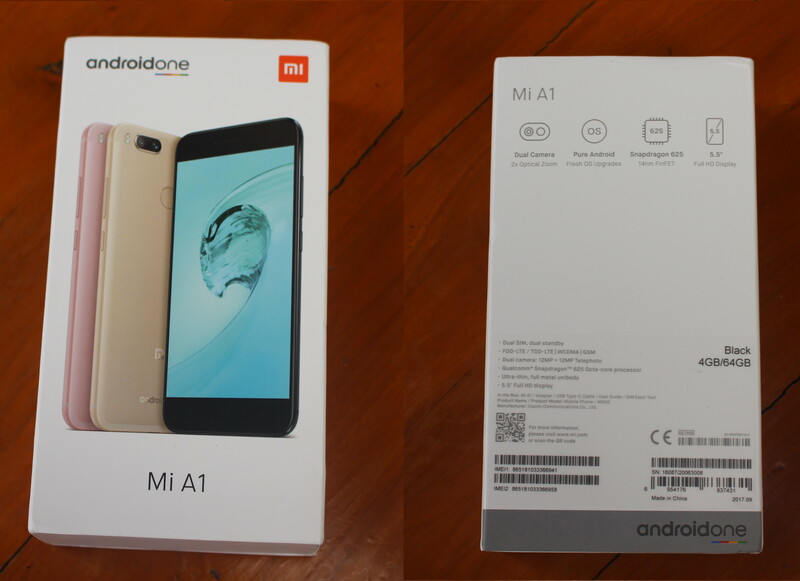 So I was quite surprised when DHL showed up with the phone this afternoon. The exact model I got is called MDG2. 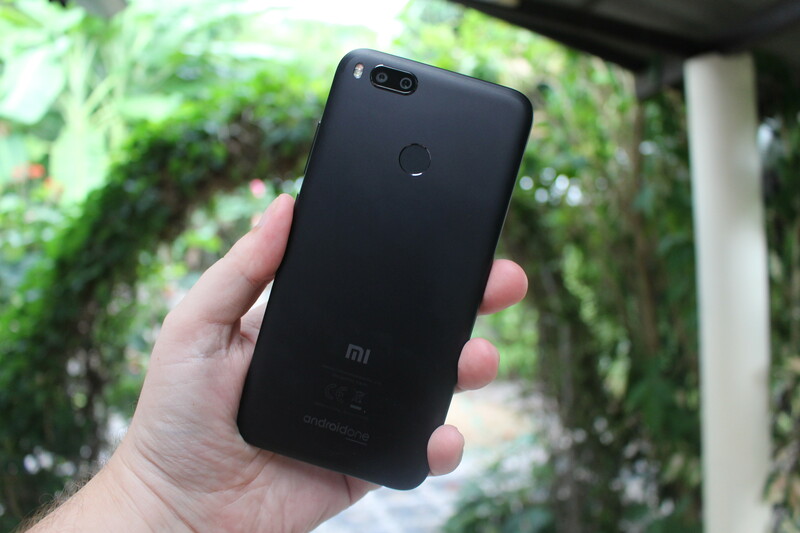 It comes with 4GB RAM, and 64GB storage as all other Mi A1 models, but there may be differences in network bands since the device will be officially sold in around 40 countries. 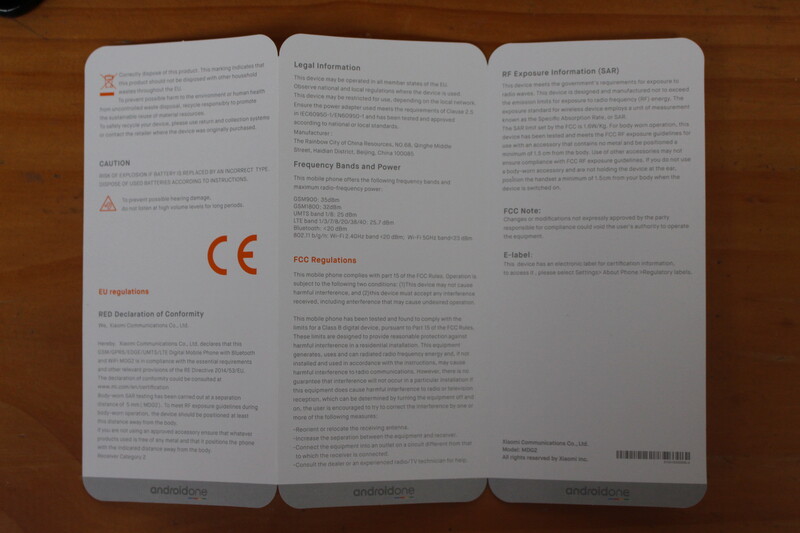 The phone comes with a short user manual in English, a 5V/2A power supply (no quick charge? ), a USB to USB type C cable, and a SIM slot tool. One side of the manual has some useful information, including how to use the SIM card tray, but the other side is mostly useless legalese, except maybe for the frequency bands and power info. 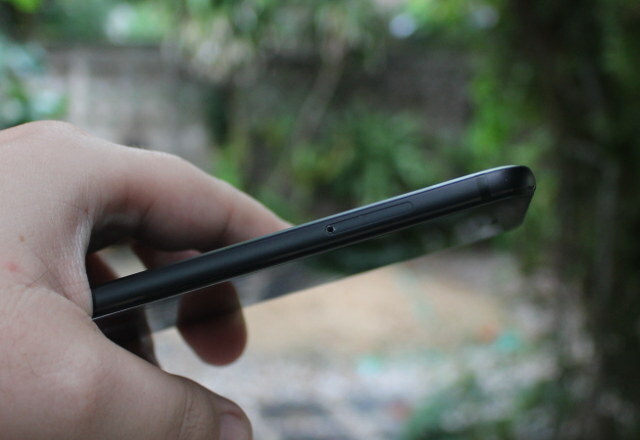 The front of the phone has the 5.5″ full HD display, camera, LED, and 3 Android buttons. The latter are a bit confusing to me, as the back and menu keys are inverted compared to my current phone. The back of the phone featuring the dual camera and LED flash, as well as the fingerprint scanner. Build quality looks good, and the phone feels a little lighter than Vernee Apollo Lite. 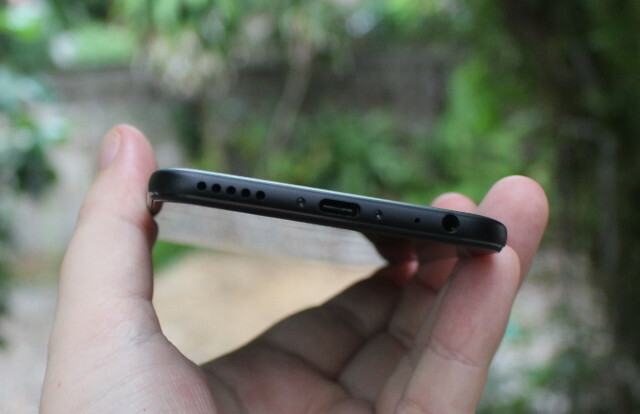 and speaker, USB type C, and 3.5mm audio jack on the bottom side of the phone. You can check the unboxing and first boot video below. 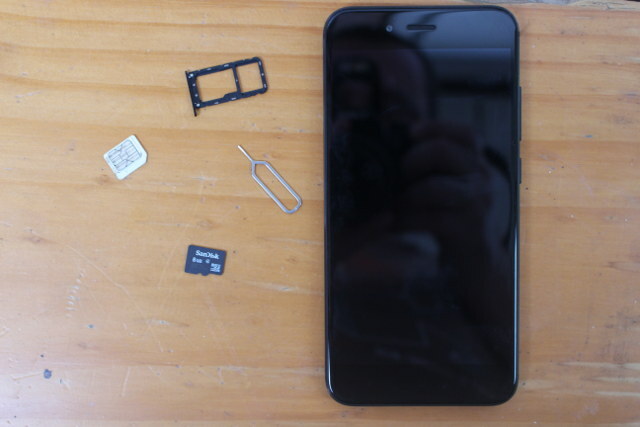 Xiaomi Mi A1 has a single slot that supports either two Nano SIM card, or one Nano SIM card with an optional micro SD card. It’s not really obvious you are supposed to do but just looking at the adapter, so for once, it pays to read the manual. 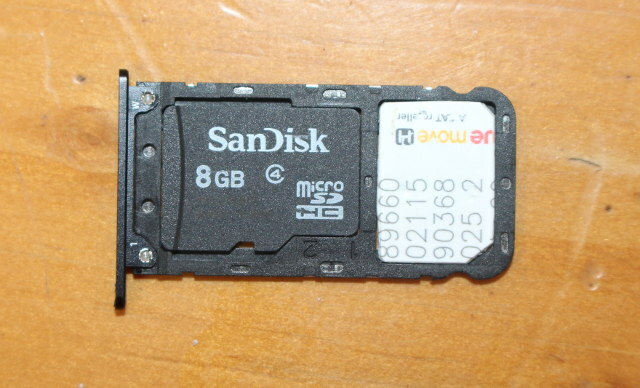 I could install a micro SD card and a NanoSIM card as shown below. Both were properly recognized in the phone. The very first boot makes go go through a wizard asking for permissions, setup WiFi, Google Account, and so on. I did not take screenshot, but if you are interested you can watch the video above. 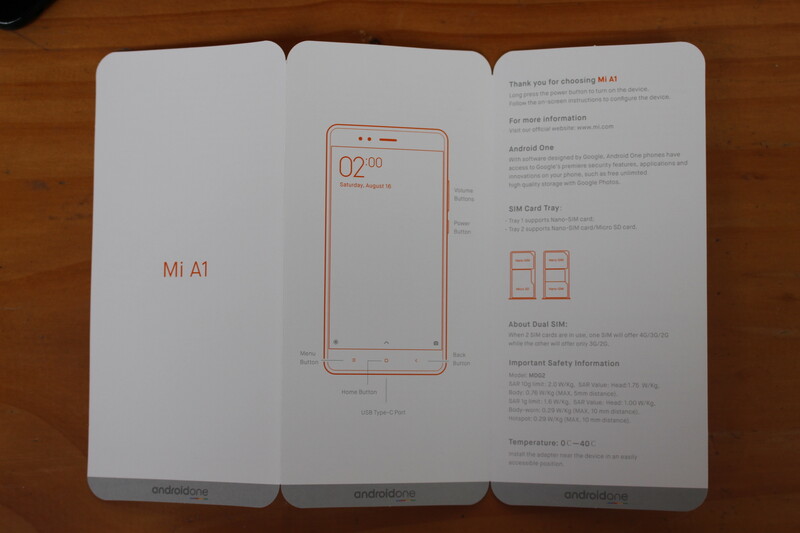 Some Xiaomi phones comes with MIUI launcher, but since the phone is part of Android One program it comes with a stock launcher. 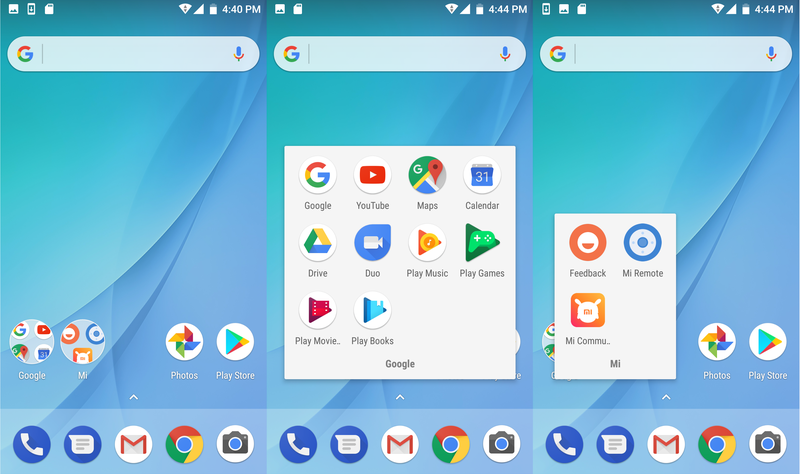 We have a folder for Google specific apps, and one for three XiaoMi apps. I logged into Google Play and install Antutu and CPU-Z, before taking the sscreen shot for the list of pre-installed apps. 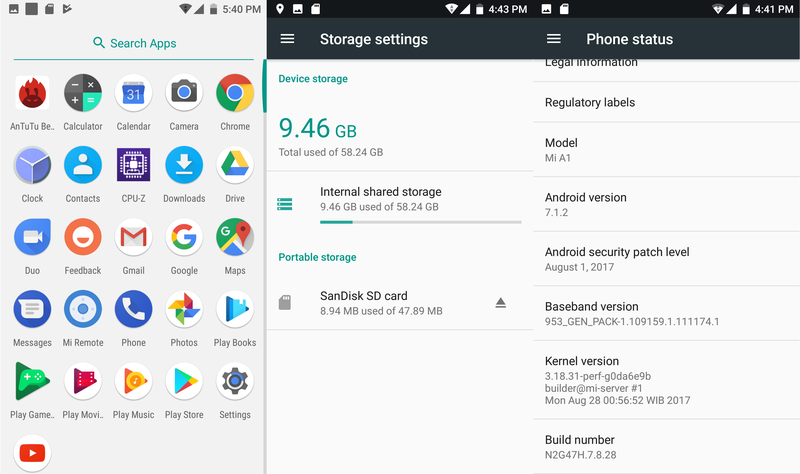 The phone has a 58.24GB internal storage partition with 9.46 GB used (48.96GB free), so I doubt I’ll use a micro SD card over the long term. 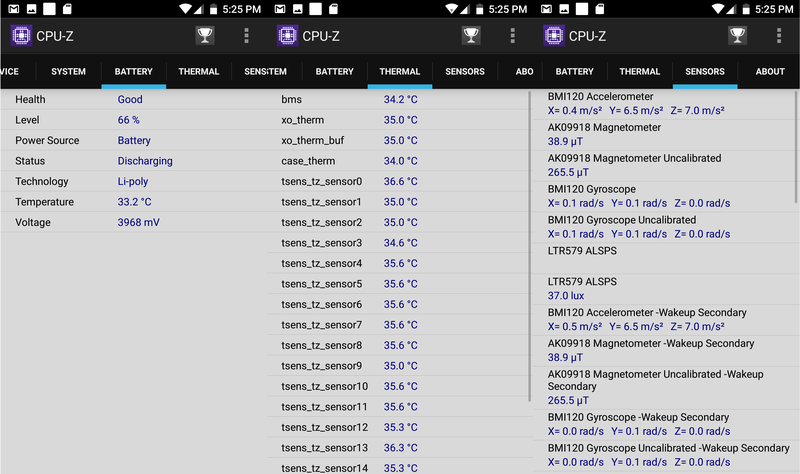 The phone runs Android 7.1.2 on top of Linux 3.18.31. Also notice the Android security patch level is dated August 1, 2017. Soon after I could see a notifications about “Android System Update (Sep 2017). Clicking on it reveal it’s a security update from Google. Rather a large 1GB download, but no problem over WiFi. 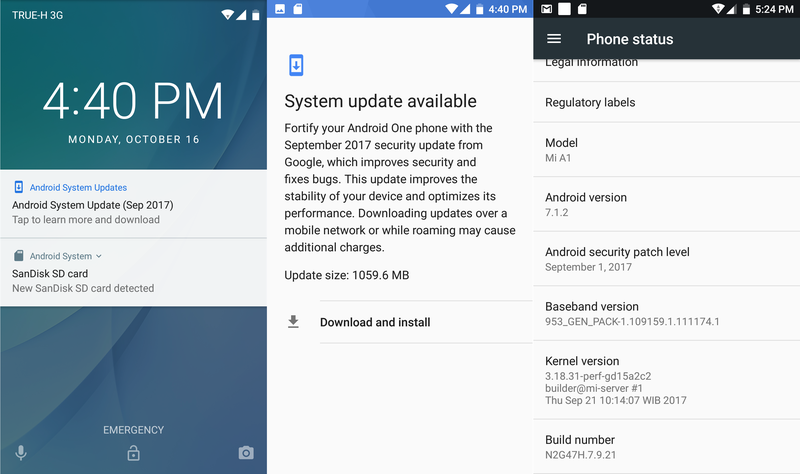 Once it is installed, you’ll be ask to reboot, and we can verify the Android security patch level is now dated September 1, 2017, the kernel is still 3.18.31 but has been updated too. That’s a nice change compared to my current Vernee phone. It was sold with Android 6.0, with a promise of Android Nougat update that never came. I still got 3 or 4 OTA updates, but nothing since January, and the Android security patch level is dated July 5, 2016, over one year old. That’s where Android One phones have a clear advantage, as I’m expecting updates until end of 2019 at least, and maybe even later for security updates. 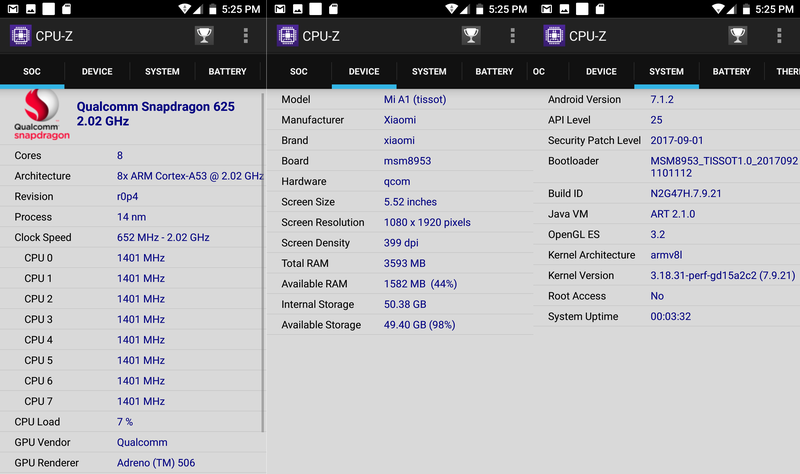 CPU-Z reports the phine is powered by Qualcomm Snapdragon 625 SoC with eight Cortex A53 cores @ up to 2.02 GHz, and an Adreno 506 GPU. There’s only 3593 MB shown out of the 4GB RAM, probably because of some hardware buffers, and 50.38GB internal storage. The phone – codenamed “tissot” – has a 5.52″ display with 1080×1920 resolution. 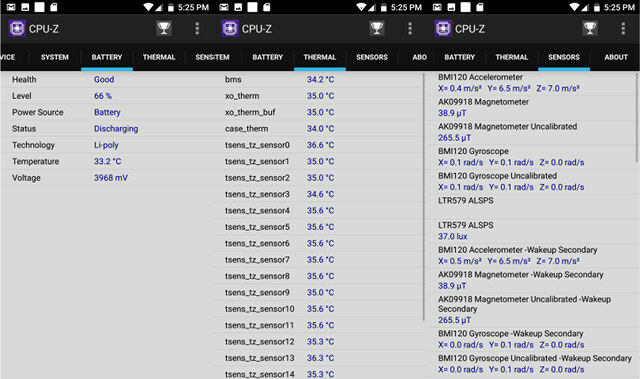 I also included screenshots about battery, thermal sensors, and other sensors (partial). 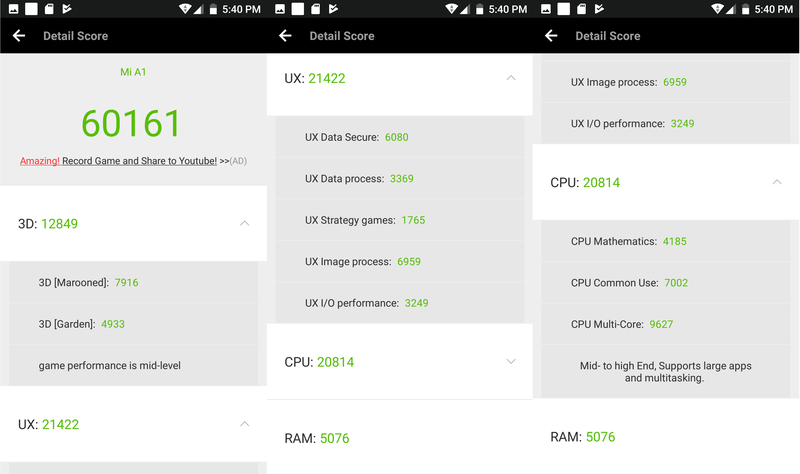 Finally I ran Antutu 6.x, and Xiaomi Mi A1 scored 60,161 points. Vernee Apollo Lite got a much higher score with 81,623 points. I’ll have to see of I can notice any differences between the two during use. I’d like to thank GearBest who kindly provided the smartphone for review, and if you’re interested you could get one for $233.90 including shipping. Coupon XMA1GJ and MI5A1FS should bring the price down to respectively $229.90 (golden version only) and $218.90 (Rose Gold). Other options includes GeekBuying, Banggood, eBay, and others online shops, as well as your local shops if the phone has launched in your country. Continue reading “Xiaomi Mi A1 Smartphone Review – Part 2: Android 7.1.2 Firmware“. So if you buy one of these 2 years from now, there will be no system updates? No wonder hardware manufacturers love Android — obsolescence is baked right in for them at the system level. a) want further updates and flash LineageOS or whatever because you know how to. b) don’t know or really care about android updates. Sure, it’s nice to have 4 years of updates on iPhones, but you can actually buy up to 4 phones like this (or 3 if you choose an older iPhone). Can you try headphone out with sensitive headphones? There’s a few reports of hissing and noise with early batches…. Yeah, i do also agree that this is a bit pricey. 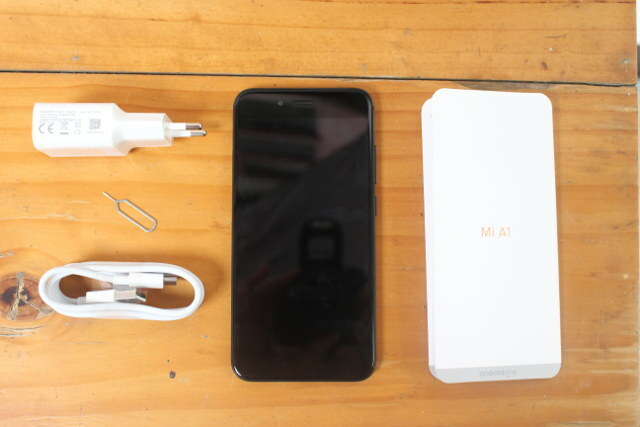 I just bought a Xiaomi Redmi Note 4X for ~ $150 and it’s pretty similar to this one in specs. Why pay ~$70 more since its “pure Android + 2 years update”. I watched a few YouTube videos with headphones on, and no problem for me. FYI the codes are dud.. they actually BOTH put price UP from £178 to £210 for me!! FAIL! It’s quite possible each coupon is set for one specific color (but no black). I’ve asked GearBest. Does it come rooted and/or is there a convenient and secure way to gain root access ? Not rooted. Root Checker however mentions it can be rooted, Difficulty: Medium. Confirmed. Low stock for the black version, so no coupon. The coupons are for the other colors. I’ve updated the post accordingly. Xiaomi Redmi Note 4, Snapdragon 625, 3/64G, 5.5″ 1080x1920px, 4100 mAh, etc. Rp 2.2M / $158 USD (before 10% sales tax) purchased in Jakarta in May 2017. For comparison the A1 is around $235 before tax, that is $77 or 48.7% more than the Note 4. Let’s call the price increase a “Google Tax”. 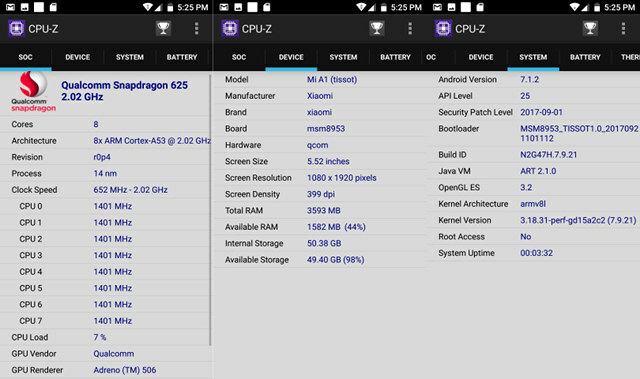 One thing seems sure for both devices, the hardware is pretty good. If only Xiaomi would get rid of the RAM hungry, buggy, old MiUI overlay across the board. So a fair price difference is more like $40 to $50. The camera may not be as good on the Note 4, and you’re unlikely to get as many firmware updates as on the Mi A1, but the latter as a smaller battery. Fingerprint scanner and IR remote control not working.